During her short life as a Cistercian nun in the Italian monastery of Grottaferrata, Blessed Maria Gabriella Sagheddu wrote detailed letters about her life there to her family in Sardinia and to her former parish priest. These letters are collected here, along with notes and letters by and to her abbess, Mother Pia Gullini, OCSO, and M. Pia's notes and recollections about Bl. Gabriella. Also included are letters to M. Pia from Father Benedict Ley, a monk of the English Anglican abbey of Nashdom, regarding the hope for Christian unity. Blessed Maria Gabriella Sagheddu was born in Dorgali, Sardegna (Italy), in 1914. At twenty years of age she entered the Trappist monastery of Grottaferrata. In 1938, she offered her life for the union of the Christian Churches and died of tuberculosis in 1939. She was beatified by John Paul II on January 25, 1983, in the basilica of St. Paul Outside-the-Walls at the end of the Octave of Prayer for Christian Unity. Mariella Carpinello, a scholar of history and monastic spirituality, is the editor of the Italian edition of the Letters of Blessed Maria Gabriella. She teaches at the Institute of Theology of Consecrated Life, Pontifical Lateran University-Claretianum and has published widely on monastic topics. David P. Lavich, OCSO, entered the Order of Cistercians of the Strict Observance at Saint Joseph's Abbey in Spencer, Massachusetts, in 1987, after completing twelve years of missionary work in Japan. After serving in Rome as a councilor to the abbot general of the Order from 2008 until 2017, he has returned to serve as chaplain to the Order's women's monasteries in Japan. "Add Blessed Maria Gabriella to the list of great monastic letter writers of the twentieth century like Merton and Leclercq. In this volume of her letters she emerges from the cloister with the clarity, sensitivity, and preciousness of St. Thérèse of Lisieux. One need not be a monastic to fall under her spell of love and devotion to both God and the monastic way of life." 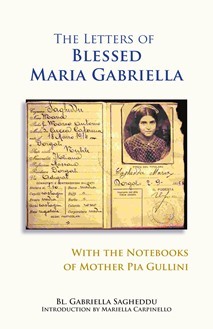 "I am delighted by the opportunity to learn about Maria Gabriella and her remarkable life, so poignantly documented in her letters and in the notebooks of Mother Pia. Lavich's English translation flows smoothly, and I found myself easily caught up in the gripping events of her life. The book was difficult to put down, as I felt simultaneously dismayed yet joyful, but most of all compelled to continue forward on my own spiritual journey. As a researcher of Italian female saints, this book is a must-read. If you love saints, then you'll love this book."